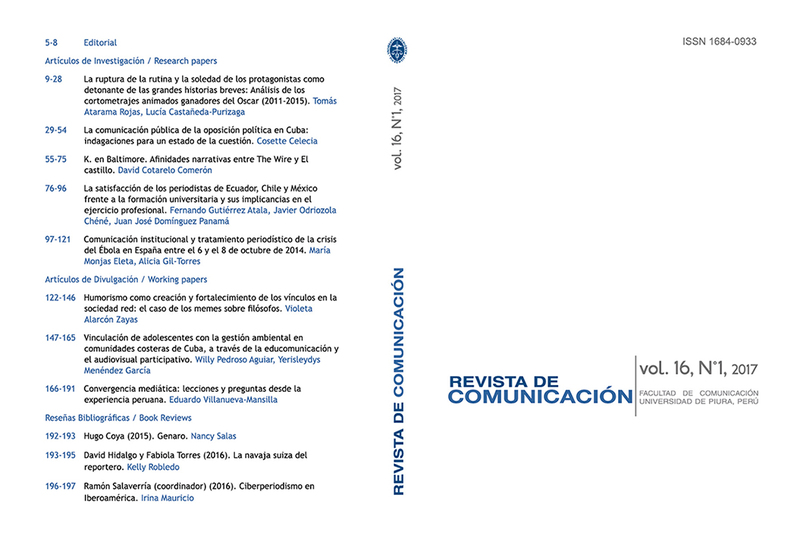 Dear readers, this is our second volume of this year's Revista de Comunicación, with which we become a semiannual journal. As it is known the communication landscape is uncertain and therefore more attractive. The profound changes, marked in the Global Entertainment & Media Outlook 2017-2021, occur mainly in six key areas: business models, value chains, technology, content strategy, deals and regulation. With the support of present and future collaborators we will continue to take the scientific pulse to the dynamic communicative reality from the diversity of approaches and themes, with the desire to be a reference in the study of communication. This issue is made up of twelve articles written by authors who come from sixteen universities and nine countries. The topics discussed are of high communicative interest and they refer to political communication, information content, Latin American communication industry, consumer ethics, communication and family, professional journalism, Japanese cinema and digital communication. Political Communication has always been an attractive research topic for communicators and we have been predominantly interested in the message; The consumption of political information is currently receiving similar attention, especially after the results of political phenomena such as the election of US President Donald Trump and the UK’s departure from the European community, or Brexit, where it is considered that voters, as consumers of certain political information, have played a key role in an issue of global importance. Professors Jordi Rodríguez-Virgili from Spain and Carmen Beatriz Fernández from Venezuela analyze and compare the political information patterns of the most interested public in how to inform themselves politically from the voters, taking as a case study the elections in Argentina, Spain and Venezuela in 2015. The Spanish professor Marta Rebolledo, seeks to clarify the concept of personalization of politics, and proposes a definition that serves as a reference for further studies on this phenomenon. And from the electoral advertising message, professors Ana Azurmendi from Spain and Pedro Fierro Zamora from Chile, suggest that electoral publicity could help us to face the decline of the civic sense of the individuals from their attitudinal dimension, which would have concrete implications in the quality of our democratic system. The content will continue to be vital in communication, so it is important to continue to investigate how it is happening in the diverse themes and areas. Spanish professors Jaime Álvarez de la Torre and Diego R. Toubes analyze the treatment of tourism security in Brazil in the spanish media before the Rio 2016 Olympic Games and show how the media contribute to being part of the image of the countries with their coverage. American professors Soo-Kwang Oh and Justin Hudson show us how the newspaper Los Angeles Times framed questions about minority communities - blacks and koreans - before, during and after the 1992 riots in the city of Los Angeles. Focusing on the media representation of the family as a social institution, professors Consuelo Martínez Priego (Mexico) and Maria Graciela Crespo Ponce (Peru), from a methodical systemic proposal of Leonardo Polo, propose three characteristics of the male-female relationship: reciprocity, complementarity and co-responsibility, which have to be studied in their mutual internal connection to understand intrafamily dynamism. The communication industry grows globally, but not all markets have the same development. According to the study performed by professors Francisco Campos from Spain, Jenny Yaguache and Nancy Ulloa from Ecuador, the traditional media of South America presented, at the end of this second decade, better expectations in the digital media transition than the communication industries at a global level. Studies on consumer ethics are scarce and recent. The spanish professor Carmen Fuente Cobo identifies the principles and criteria for an ethics of communication users that can be referent in the current digital environment and who demand a responsibility. We are accustomed to the American cinema of Hollywood, and it is the most studied, but in the increasingly global sphere, it is interesting to analyze other views, such as the Japanese cinema. Professor German A. Duarte (Italy) analyzes the characteristics of the work made by Japanese director Yasujirō Ozu, as well as the relation that this director established with the cinematographic camera. The informative work carried out by journalists is important to the society; therefore the professional responsibility and the ideal conditions of its exercise are of great interest. From this perspective, professor Francisca Greene, through interviews, discovers that the economic pressures of the company owners reduce autonomy to the Chilean journalists; and that social networks mean a factor to take into account in their publications. Digital communication as a valuable alternative for the indigenous communities of Colombia, who have the possibility of expressing themselves, making themselves known and making their own agenda visible, is the theme proposed by Neyder Salazar Torres, a colombian professor. Finally, professors Gustavo Garduño and Robert Stingl from Mexico present the ways in which myth has found, in its relation to objects and consumers, the material, spatial and temporal limits that must be overcome through permanent adaptation through discursive mechanisms. The Revista de Comunicación continues to be implemented. This year it has registered its trademark in the Patents and Trademarks website with which its intellectual property is recognized. Also, it classified in the International DOI Foundation and has its own Digital Object Identifier (DOI) that allows it to identify the articles in a permanent and safe form. Our articles are widely cited in Google Scholar statistics.